Let’s agree on one thing. Siberian Huskies are gorgeous, free spirited and quite a handful. With all that good looking fur and those blue eyes, you would think it is easy getting them to learn a few things. Siberian Huskies are quite difficult to train. If you are a first time pet owner, you will have a hard time getting her to sit still. Unlike other breeds, Siberian Huskies don’t really care about pleasing you so motivating her to show obedience is another matter. However, with a little training, they make highly capable and helpful pets, and this is what every Husky owner wants. Also, they deserve a lot of love and good care, and that is why you should get your pet the best dog accessory. Speaking of accessories, an important one that comes to mind is a harness. This product helps to keep your pet safe and also makes it easy for you to control her. Of course it comes with its own pros and cons, which we will look at later on. 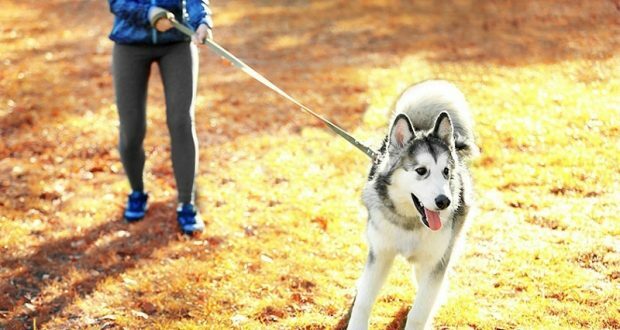 Before we get there, let’s look at the benefits of buying a harness for your dog and the top seven best Husky harnesses for a Siberian Husky. 3. Mighty Paw Training Collar, Martingale Collar, Premium Quality Limited Cinch Collar. When your pet is outside playing, there is no guarantee that she will always be safe. Having said that, a collar and leash are not enough. Sometimes pets run off on their own, even those that have enough training. A harness goes a long way to prevent this, especially if it comes with a reflective fabric or stitching. If it happens that your dog takes off for a walk on her own, it is very important that she is easily seen. Also, harnesses improve the safety of your pet while she is riding in your car with you. There are harnesses that come with D-rings that can be used with a safety belt so that it holds your pet in her seat. One strong tug against your pet’s collar can easily break her neck, causing a fractured backbone or a crushed trachea. Also, in some cases, a dog may develop hyperthyroidism because of trauma to the thyroid gland. In other instances, your pet may develop eye or ear problem due to too much pressure on the neck region. Therefore, a dog harness will spare your pet all this misery. Harnesses are manufactured methodically so that you can control your pet without necessarily hurting her. If you are nursing an injured dog, a harness is just the right thing to help her move around the house. Supposing your dog suffers from a respiratory issue, she will be able to maintain that position the vet recommended with the help of a harness. If you wish to train your Husky so that she develops disciplined reactions to instructions, teach her to know when pulling is not necessary. Dogs are intelligent creatures, a little less than you, but smart all the same. However, your Husky still needs to be given immersive training so that she can behave well. A leash is helpful, although temporarily, when compared to a harness. Instead, try a harness because it will help you reinforce good habits in your pet. Not all harnesses come with a handle. A handle is important because it allows you to control and direct your dog around when you two go out for a walk. So if her harness does not have a leash attached, the other way to control her or even get hold of her if she decides to bolt is through the handle. Small breeds are pretty easy to control so a handle may not be that necessary. 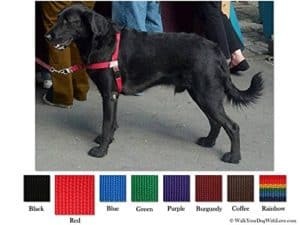 Dog harnesses are made from a variety of materials. This explains why some harnesses last longer than others. The most common material, however, is nylon. Why? Well, nylon is ideal for pet owners who live in humid areas. 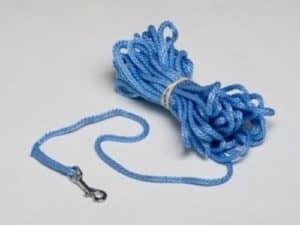 So if you want a water resistant material for your harnesses, nylon is the best choice. You could also try leather, although most pet owners don’t prefer it. Padding is important as it adds comfort to the harness. Most dogs don’t like a harness that does not have padding. So it is best to find one that has padding so that your dog feels comfortable when wearing it. That means you may have to spend a little more because these features makes harnesses relatively pricey. Be sure to check your dog’s size before you purchase a harness. Each manufacturer has their own size, so harness sizes are not a perfect fit for all dogs. So how do your determine your dog’s size? The best way is to measure her chest girth. Once you have that dimension, consult size charts of the harness you wish to purchase and find one that fits your Husky. Some harnesses are designed with weight in mind, so make sure that you know how much your dog weighs. Traditionally, Siberian Huskies are supposed to be sled dogs. So they will do a lot of pulling however much you try to train them out of it. If you live in an area with lots of snow, a pulling Husky is highly beneficial. However, a city dweller has no need for a pulling Husky. In fact, pet owners who live in the city prefer a Husky that does not pull at all, especially when you take her out for a walk. With LovinPet Large Dog Harness, your Husky becomes well behaved. Instead of pulling, she will start to act pleasantly towards you. This harness gives you absolute control over your Husky. For one, it is highly adjustable, fits very well and you can rely on it to last for a long time. This harness is highly functional. For you, that translates to nice walks and other outdoor activities alongside your Husky. Ruffwear Front Range All-Day Adventure Harness offers your pet a lot of comfort all day thanks to its well-padded chest plate. 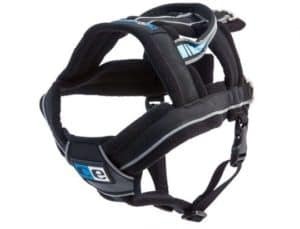 The padding is important because the harness is able to distribute force during pulling very well. If you love experimenting with colors, there are lots of colors to choose from so you can easily find something that suits your taste. Also, there are two points of attachment; at the breast plate and the back. The one on the breastplate causes your Husky to spin if she tries to pull. The material used for the fabric is a little rigid, so if you own a lightweight Husky, you are very likely to notice that there is hardly any stretch. If you are a collar person, this is just the right accessory for your Husky. Other than a beautiful finish, this collar is manufactured from very durable materials and the overall design looks pretty broad. This way, the collar does not dig into your Husky’s neck region or her skin in general. In terms of performance, this collar gives your Husky the cue she needs so that she won’t pull. A surprising inclusion is nylon webbing that comes with a chain and reflective stitching so that your pet is easily seen in the dark. This is a perfect accessory for training purposes because it tightens a little whenever your pet pulls but not to the point of choking her. Who said you have to spend big to get a great harness? And you don’t need to go for just about any harness just because you want to get her under control. 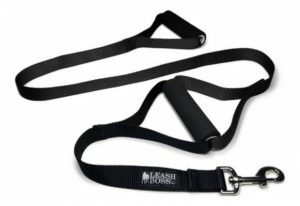 For a great experience, find something that is made by people who understand what harnesses are all about like Leash boss. 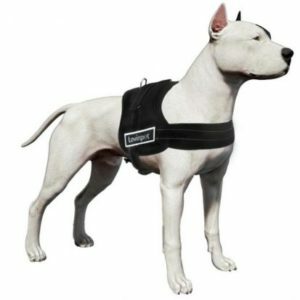 Their harness lasts long because it is made out of a highly durable nylon. So you don’t have to worry about heavy duty use or abuse. Also, you get a harness that longer than standard size because it is designed for large breeds like Huskies. Something else that might get you excited is that it comes with two fully padded handles! Essentially, you are in full control. Have you recently bought the collar of your choice? Well, in that case then how about a matching leash to spice up your adventure? Lightest Long Line Ever is what you are looking for and you will not be disappointed. For starters, your pet has enough freedom to run around although you can easily reel her in if you feel that she is behaving badly. The other thing you can do is to just step on the line and she will not go anywhere. Impressive right? This product measure a whopping 50 feet without feeling bulky. Actually, it pretty light for a line that long. However, it is not that tough and can easily snap if your dog is on the heavier side. Husky owners will tell you that their muscle power does not make them the nicest walking companions. You have to make some adjustments so that she does not pull you along. Getting the right collar or leash might help to some extent, but nothing works better than a harness. So you need to find something like a No Choke No Pull front leading dog harness. This harness is a little different because it is attached at the front. So it is possible to control or steer your pet around easily. The best part is that there are no rough or sharp areas so your dog will not chafe at all. Plus, this harness is made out of high quality polypropylene. It weighs less and is designed to feel and look comfortable around your pet. You also get total adjustability while the material is highly reflective. As a pet owner, you always want to find the best harness money can buy. Canine Equipment Ultimate Pulling Dog Harness is one such product. 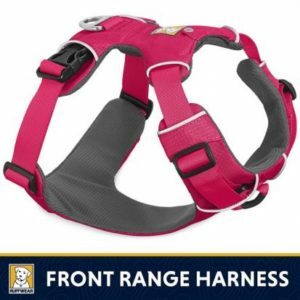 It is among the most comfortable harnesses in the market mainly because it is well padded in all the right places. To make your dog’s life even better, the harnesses comes with a layer of fleece for extra comfort. If your preference is safety above all else, Canine Equipment Ultimate Pulling Dog Harness comes with snap shackles. This is a useful feature because it can stop your pet from slipping out of her harness. It come in very many sizes so not dog is left out. Getting your dog to learn a few things is a tough job, especially if the pet in question is a Siberian husky. So she is likely to require regular training. Consistency works wonders so you need a good harness to speed up the training process. LovinPet Large Dog Harness No Pull has you covered. It works well during walks and has lots of usability. Next time you go shopping for a harness for your Husky, this is the product to try.